At the top of the hill with my shopping cart and cane, I took a look at my feet and saw how they were improving after my foolish stint of showering with the same socks on for these three years. How stupid. The fungus grew between the socks and my feet. How stupid. 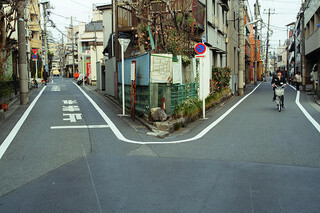 Well, here I am at the fork in the road, I turn around to look at the distances I have come, all the hardship and turmoil I have experienced, the good things and the bad things. I then turn to look at the distances I have to go. I still see the same as what I saw when I left. I then turn to look at the starting path on this night and I see happy times, wealth and prosperity. I turn again and look at the path I’ve traveled. I immediately look to the sky. I said, “Que sera, sera.” Then I started walking on my original path. I know how to function in this manner, a change could be completely different. I couldn’t cope this way. A change would be nice at my age but I could not exist. Willie and Trace got married this past April. In the two years they’ve known each other, they’ve faced challenges both as individuals and as a couple and the two are still working hard to stay strong. “Trace put me on track,” Willie says. “She said ‘stay straight or hit the door.’ ” Shortly after they met, Trace started accompanying him to Holy Apostles Soup Kitchen, which had been a source of Willie’s strength for many years. Originally from L.A., Willie was kicked out of home by his mother at only seventeen. After that he left California, traveling “from city to city” on a quest to find his father – a man he hardly knew. It was here, in New York, that Willie finally tracked him down, living on the Upper East Side. Unfortunately for Willie, the reunion he had dreamed of didn’t offer all he hoped it would. With nowhere left to turn, Willie found himself homeless and on the streets. 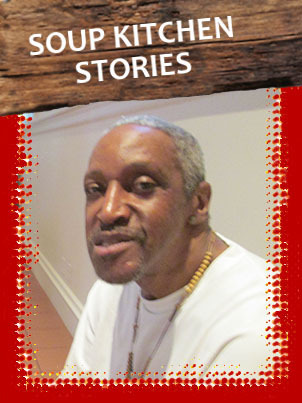 For Willie life on the streets was tough and he turned to drugs and alcohol to numb his pain. Sleeping at nights behind the Holy Apostles Church he would often see the line extend around the block. After a while he decided to join them, and he found the soup kitchen could offer him a lot more than a hot meal. After a while Willie built up enough trust to speak to one of our counselors who secured a referral to an inpatient treatment program. Despite his best efforts, addiction still had a strong hold on Willie and it took him several years before he would stay more than one or two nights. He finally decided to “get serious”, and stayed for thirty six months in a program that helped him develop skills for the outside world, include work skills. He found his favorite jobs were in the kitchen. Today, Willie’s life is getting back on track. As well as being married to Trace, he has secured a job he is proud of, working for a catering company, delivering pastries. Although he is earning for the first time in a long time, it is still tough for Willie to make ends meet. Coming here for lunch as well as additional services like haircut vouchers helps Willie stretch his budget. Although the couple had their own rental apartment for a while, due to dangerous and violent circumstances in their building, they were forced to leave. Once again, the support they found here was key to navigating this next phase of their journey together. and just looking at sunset and watching people playing chess at Union Square Park, and looking at birds flying in the Park. Summer is a beautiful season so just enjoy it every minute. Hamilton, a United States Marine Corps veteran, found himself homeless after personal issues forced him out on the streets. He came to the soup kitchen for a meal and was happy to find the additional help and support offered by our social services center. One of our counselors referred Hamilton to Samaritan Village, an outreach group that helps homeless veterans, and is onsite at Holy Apostles Soup Kitchen every Tuesday. Only one week later Hamilton had a home secured, complete with donated furniture. Once he was back on his feet it didn’t take Hamilton long to land the job at Big Bus. It perfectly suits this man’s friendly and outgoing demeanor. He says he can get along with anybody and part of that is from his experience as a soldier stationed abroad. Hamilton was stationed in Vietnam in 1975. He also served in the last regional operation to evacuate the American embassy in Phnom Pen, Cambodia. “That’s the one in the movies. Operation Eagle Pull”, he says proudly. He keeps his veteran I.D. card and his Big Bus Tour I.D. card together on the lanyard hanging around his neck. “I love my job and it pays well!” From getting people out, to getting people around, he has certainly gotten himself into a place where he is happy again. “Because I wasn’t already in the system: I wasn’t on parole, I didn’t have HIV, I didn’t have children, I wasn’t in drug or alcohol treatment, I’d never stayed at a homeless shelter….I didn’t qualify for a lot of programs,” he lists off the reasons he was given. “I know…the feeling of homelessness. You have so much stuff. What’s going to happen to it? It’s a big weight”. Since then Edward has racked up an impressive 1000 volunteering hours at the at soup kitchen and become a familiar face on the serving line. Today, Edward is an adored uncle to many nieces and nephews he has helped raise. Two of his nieces took him to Atlantic City for Father’s Day. He also speaks adoringly about his long time girl friend “who” he says “was with me at my lowest.” Edward now has regular employment and he’s found a permanent place to live – somewhere he can call home. He is grateful for how Holy Apostles Soup Kitchen has supported him through all these transitions, providing nutritious meals as well as Metrocards when he has needed them and other support services. Edward credits the “teamwork at Holy Apostles”, as well as family and friends, for keeping his hope alive throughout it all. Because of his own experience, Edward knows hard times can happen to anyone, and that’s why he goes out of his way to talk with guests coming through. For Edward, this “homework” has been: showing up, giving back and reaching out to others to help them as he was helped. And we feel lucky that he’s chosen to do that here. 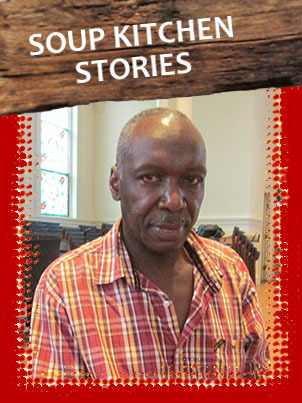 John remembers eating at Holy Apostles Soup Kitchen about nine times before the fire in 1990. Back then, meals were served in the annex of the church. John was living at Bellevue Men’s Shelter and a friend told him he could find a good meal here. A lot has happened since the turn of the century, and John’s come a long way. 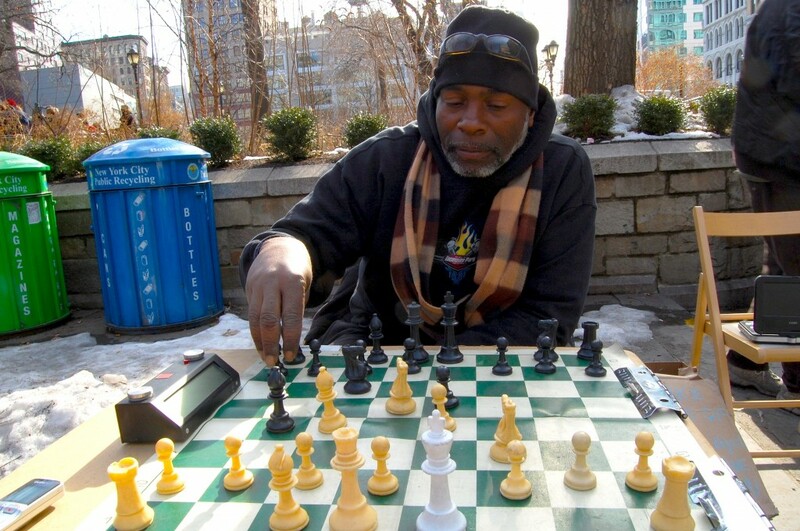 With the help of the support programs at the soup kitchen, John hasn’t been homeless for about seven years and now lives in Section 8 housing. John’s encounter with someone at Holy Apostles who went out of their way to be kind sticks with him to this day. “I remember when the social services was out of a trailer outside. It was about Christmas time and one of the workers was walking through. She gave me a very nice coat, and a referral to a thrift shop with a voucher for more clothes. 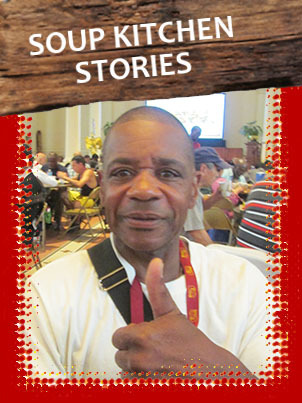 I got a great new pair of boots that really made a difference.” This was a turning point for John. He knew he could count on the support offered here, and began his journey toward permanent housing.